BAC is the first manufacturer in the world to develop a car featuring panels made from graphene, the innovative and lightweight material that brings weight and strength benefits. BAC has partnered with Haydale Composite Solutions to create rear wheel arches made out of graphene, and has been putting the material through its paces on the Mono, the world’s only road legal single-seater supercar. Graphene is made of sheets of carbon just one atom thick, and is significantly lighter than standard carbon fibre. It is also stronger than carbon fibre, meaning that it can bring weight reductions of around 20% while being 200 times stronger than steel. These benefits could have implications for cost, performance and fuel economy when applied wider in the manufacturing process. BAC Development Director and co-founder Neill Briggs said: “BAC is uniquely placed in the automotive industry to be able to take innovative steps, and latest work with graphene is further proof of this. This development work is further proof of our ability to work with the very latest materials and innovators. At BAC we don’t wait for new technology to come to us, we actively seek it out and work with the very best in the industry to stay at the forefront of the automotive and motorsport industries. 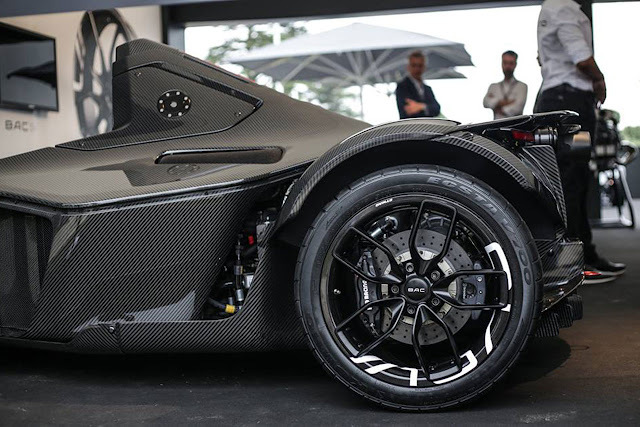 Ebby Shahidi, Haydale Composite Solutions Ltd.’s Director of Aerospace and Defence added: “We are pleased to have worked on the design and development of the graphene enhanced carbon fibre materials for the BAC Mono. These initial materials have shown some major increases in impact and thermal performance coupled with improved surface finish and it’s pleasing to see these attributes being demonstrated on such a high performance vehicle as the Mono. BAC showed the graphene enhanced Mono at the Science in the City festival in Manchester.